Literarily speaking, aquatic travel for recreation began in 1857 with Henry David Thoreau’s Canoeing in Wilderness. Common sense dictates that he was hardly the first to cast off with no grander purpose in mind, but the pastime was undoubtedly new—a primitive luxury afforded by the vast, sparsely populated American landscape. 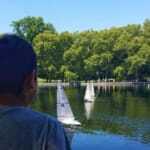 Sailing strictly for sport, by contrast, was some two centuries old by the publishing of Thoreau’s piece. The Dutch began racing their yaghtschip early in the seventeenth century, and initiated what could be coined the inception of international maritime competition a few decades later when they bestowed one of their vessels to Charles II of England. Yet while the seed of tradition may have been planted in the mid-1600s, the day upon which it took its strongest roots was the 3rd of May, 1851. On this date, Commodore John Cox Stevens of the New York Yacht Club launched a 101 foot schooner named America en route to England to participate in the annual Isle of Wight regatta. Ten weeks later they emerged victorious, having defeated the next closest opponent by a full 18 minutes. The prize bequeathed upon them that day, a cookie cutter ornate sterling silver ewer purchased and donated for the race by the 1st Marquess of Anglesey, since dubbed the America’s Cup, remains the oldest active trophy in any sport. Thoreau wrote first on the subject of traveling by water for personal gratification. What followed next may have been attributable somewhat to his influence, but more likely was rather a product of the era—a natural and inevitable progression. Other writers followed suit, and a romantic ideal was born. Bodies of water of every shape and size transformed to modes of transport for pleasure seekers, and by century’s end a new industry had come into existence: cruising. 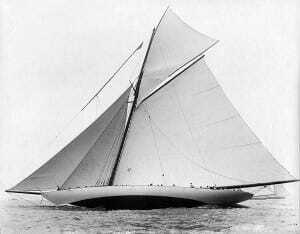 In accordance with the spirit of the times, the first recreational sea cruise set sail in January of 1891. In less than a decade, the practice was so popular that the fledgling industry shifted from using off-duty ocean liners and freighters to designing purpose-built vessels uniquely suited to the task. While international sport sailing began its Renaissance in 1870 with the first challenge of the cup won by Commodore Stevens’ crew, cruising began hers in the late 1970s. Both are still going strong. Cruising has attained status as a seminal vacation destination for couples, families, business retreats, or virtually anybody with at least a few days and a few hundred dollars to spare. 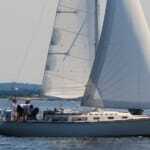 Sailing, meanwhile, found a global television audience of over 250 million in 2012 and even garnered an Emmy. 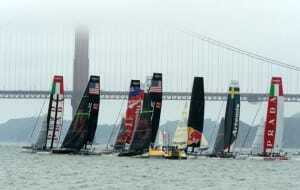 ENTER THE 2013 AMERICA’S CUP. For 125 years, beginning with the first challenge in 1870, every defense but one was held in the United States. 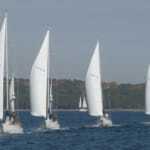 Since the San Diego Yacht Club’s 0-5 loss to the Royal New Zealand Yacht Squadron in 1995, however, the event which bears this country’s name has been held abroad. 2010’s defeat of Ernesto Bertarelli’s international mercenary squad Alinghi by the Golden Gate Yacht Club brought the event back home, to be hosted for the first time ever in San Francisco. If one were to recount the truly iconic bodies of water in this country, the main contenders are obvious—the mighty Mississippi and its mouth in the Louisiana delta; the Great Lakes and Niagara Falls; the Yellowstone crossing the volcanic plateau of northeast Wyoming and its resultant geyser basin; Utah’s inland sea, the Great Salt Lake… San Francisco Bay belongs on this list — ecologically important as a haven for Dungeness crab, salmon, and waterfowl; historically important as the western terminus of the First Transcontinental Railroad and as the location of Angel Island, the Ellis Island of the Pacific, as well as Alcatraz; architecturally important as the home of the Golden Gate Bridge and Bay Bridge; and geographically important as the entryway for the third, fourth, and eighth largest cities in California, to say nothing of its close proximity to Yosemite National Park and the lynchpins of Northern California wine country: Napa, Sonoma, and Paso Robles. If the aforementioned alone was not enough to qualify the Bay as a fortuitous choice for the America’s Cup, consider this: the region’s geography and climate provides a near steady 15-25 knot wind from the west/northwest, while the five large islands serve as a barrier from larger swells. As sailing conditions go, the Bay’s are hard to beat. One of San Francisco Bay’s many functions is that of a cruise ship terminal. Due to regulations requiring most large cruise ships to visit at least one foreign port on each itinerary, San Francisco isn’t as common a stop as Seattle to the north or San Diego and Long Beach to the south. Because it doesn’t fit tidily into a week-long itinerary to Alaska or the Mexican Riviera, it functions largely as the feature point of the repositioning cruises that serve as the bookends to the May-September Alaska season. Itinerary planners at Celebrity Cruises, spotting the unique opportunity to position a ship in harbor for a day at the races, made an adjustment to their annual fall wine cruise, docking their flagship Solstice at Pier 39 for the America’s Cup’s fifth race on September 15. Historically speaking, day five is a good day to be around—in the last 50 years, the Cup has been decided by the fifth race over 40% of the time. Geographically speaking, Pier 39 is a good place to be around—the best views of the race are a half mile west at the Hyde Street Pier and Van Ness Avenue, and the race concludes a half mile east at Pier 29. Keeping with the essence of the uniqueness of this opportunity, American Sailing Association has elected to make this cruise a cornerstone of our 30th Anniversary celebration. In years past we’ve organized group outings, presenting our members with a forum to meet and share experiences with fellow sailing enthusiasts from around the world. This is a special landmark year for us, and accordingly, this year’s outing commemorates that landmark by taking advantage of the exceptional chance to observe the masters of our craft in their definitive hour. 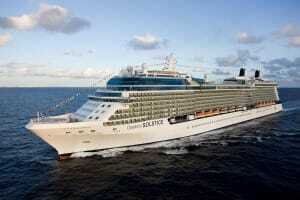 The cruise begins in Seattle on the afternoon of September 13, ending in San Diego on the 23rd. If you’re also a wine enthusiast, you’ll be happy to know that the voyage’s normally scheduled wine theme will largely remain intact, with opportunities to visit vineyards at most ports of call, as well as an extensive onboard wine program. For culinary buffs, the Solstice boasts no less than ten dining venues. The ship also features a spa, a Monte Carlo-inspired casino, a hot glass blowing show, an extensive library, onboard lectures and classes, and even an outdoor lawn with live grass for picnicking and croquet. Limited space is available, so if you’d like to join our group for this special celebration, please contact our group travel expert: Nathan Mason, Montrose Travel. (800) 301-9673, ext. 521 / (818) 553-3220 Direct. Email: nmason@montrosetravel.com.